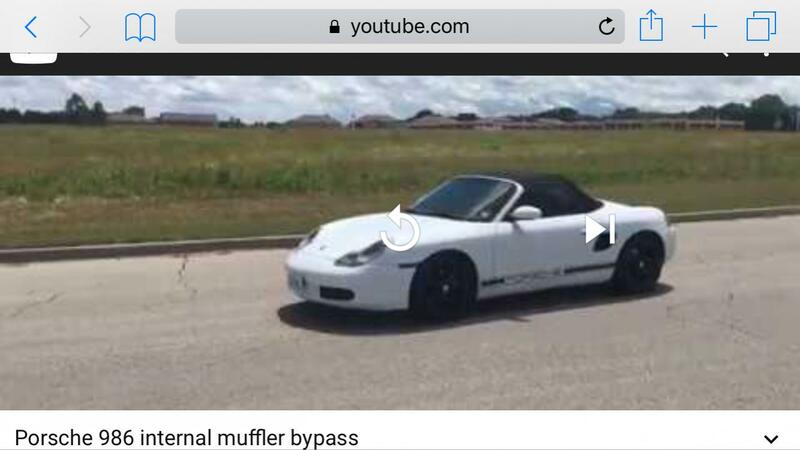 As I mentioned in the Crios Mod thread, I had an idea on how to modify the stock muffler for more sound without any visible traces on the outside. Now it's done! 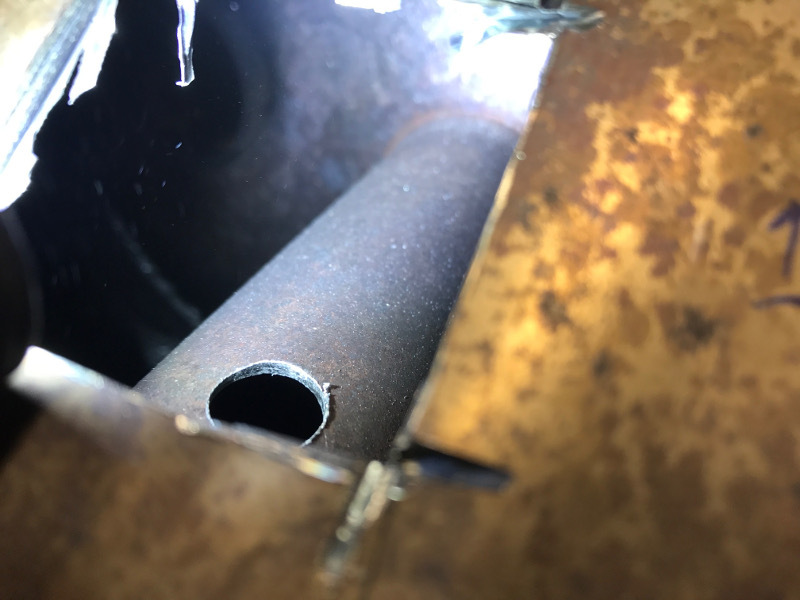 Make an opening on top of the muffler, right where the exhaust inlet is, drill a hole straight through the inlet pipe so the exhaust gasses can take a shortcut to the pipe that leads straight to the outlet. 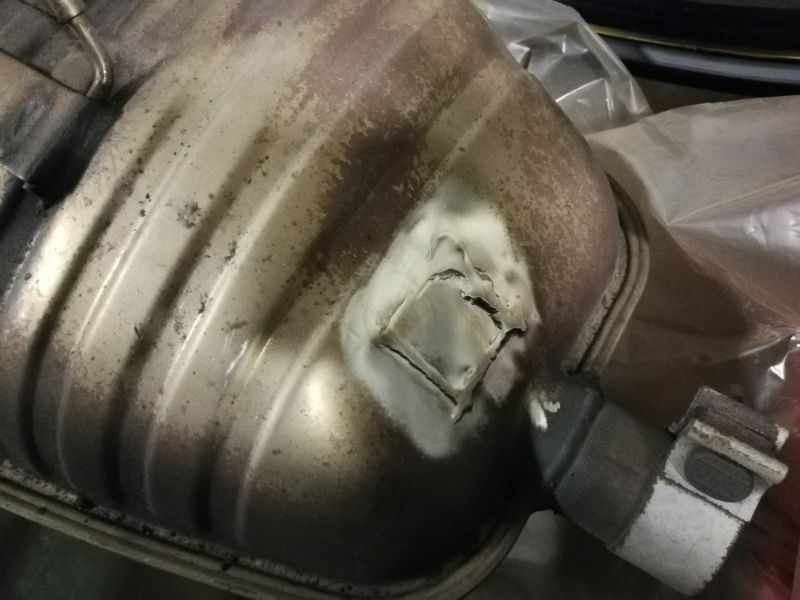 I bought a second hand muffler for virtually no money at all (like $60) and paid a skilled welder and metalworker less than $100 to get the work professionally done. I chose a 12mm diameter for the holes. They go straight through the inlet pipes, so there's two holes in each pipe. All welded up! He could have made it better looking, but since it's on the top side of the muffler, it won't be visible. Making it prettier would have taken more time, which would increase the cost. I'm happy with it. The next step is to clean up the muffler, perhaps paint it with some heat resistant paint and polish the exhaust tip. During the winter I'll see if I can mount it on the car, which is currently 400 miles away, and see how much of a difference it makes. How do you like the sound? I made my holes much bigger than that and still feel it could be a bit louder. I don't know. As I mentioned in the post, the car is 400 miles away, so it's not mounted yet. I will make sure to record the sound before and after, though. Updates will come, perhaps as soon as in April. 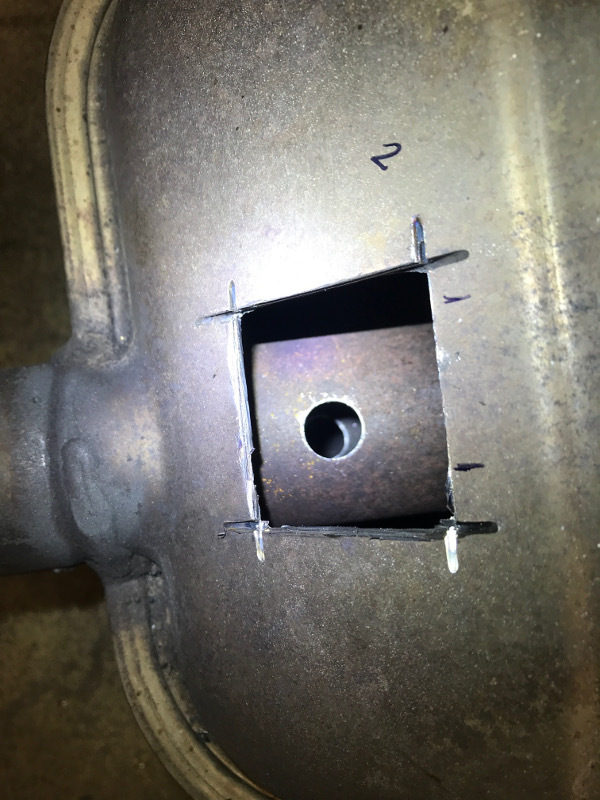 Edit: Considering your experience, I think I'll get in touch with the welder again to have the holes redrilled to 20mm instead. Last edited by fridsten; 11-25-2017 at 07:10 AM. Anyway, I decided to give it a shot and install it anyway. Here's the result. I quite like it. It's a bit louder, but not anywhere near obnoxious. And considering that the wife will drive it 300 miles on thursday, that's probably a good thing. If I still want more, I can always add a couple of Crios holes as well. Last edited by fridsten; 05-08-2018 at 10:48 PM. I like this idea. 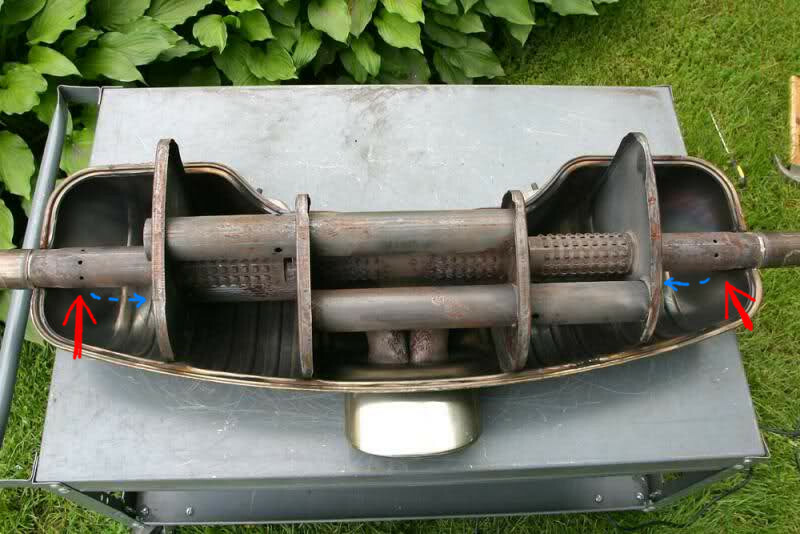 I have a spare muffler I'm going to try this on. I'm planning on going way bigger though. At least 1 1/2 inch holes. Still loving mine. It's just about the perfect exhaust: nice idle growl, loud (but not too loud) at higher rpm and no drone. You went with 1 inch holes correct? I went through both sides of the pipe with a 1" bit, so two 1" holes for each inlet pipe. The area of a 1" hole is 0.79" sq., so I have 1.58" sq. on each side of the muffler. For reference, a 1.5" bypass pipe has a cross sectional area of 1.77" sq., so I'm fairly close to a 1.5" pipe. A 2" bypass pipe would be 3.14" sq. Though I do love it, if I did it again, I'd do a third 1" hole on each inlet. I wouldn't mind just a tad bit more. Last edited by particlewave; 05-08-2018 at 02:26 PM. After having driven it for a bit, I realized that I want it a bit louder. I think I'm going to do the Crios mod as well. It's not what I had originally planned, but since the welder screwed up the measurements and the muffler is mounted on the car, I think it's a reasonable solution. Am I missing something, why cut into the box, why not drill straight through? It's not like you could miss the pipe internally. Either way, you'll have a hole that needs a plate welded on. Cutting a larger hole would certainly make the work a bit easier. You're not going to drill through the body and pipe in one pass, anyway. You have to drill or cut a large hole through the body, then center punch the pipe so the drill bit doesn't just slip off of it. 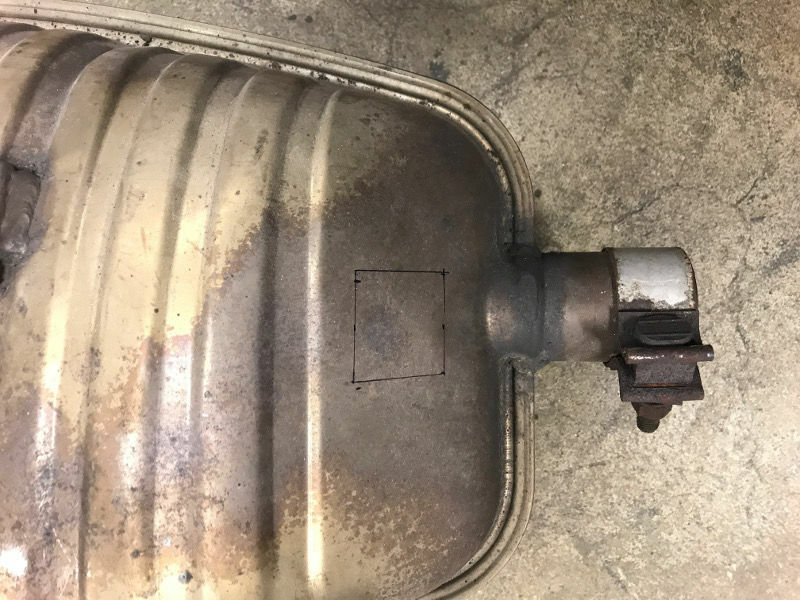 Would it make sense to make the cutout on the bottom of the muffler and only make a hole on the bottom side of the inlet pipe? I ask because the outlet is below the inlet pipe. So if you only made a hole on the bottom near the outlet, it would seem more sound would make it to the outlet. Maybe it doesn't matter either, not sure about it. What do you guys think? To be clear, blue line on left side is inlet and the red line below it is the outlet to the tip on the left side. I really don't think it would matter. I went clean through the inlet, so there are holes on top and bottom, anyway. The benefit of doing it from the top is that it looks 100% stock since the welded on plates are hidden up top. Side note: I went through a short tunnel the other day...holy balls! It's sounds beastly! I'm going to have someone do a video of a drive by soon. Last edited by particlewave; 06-24-2018 at 04:15 PM. BTW, I made my holes larger. 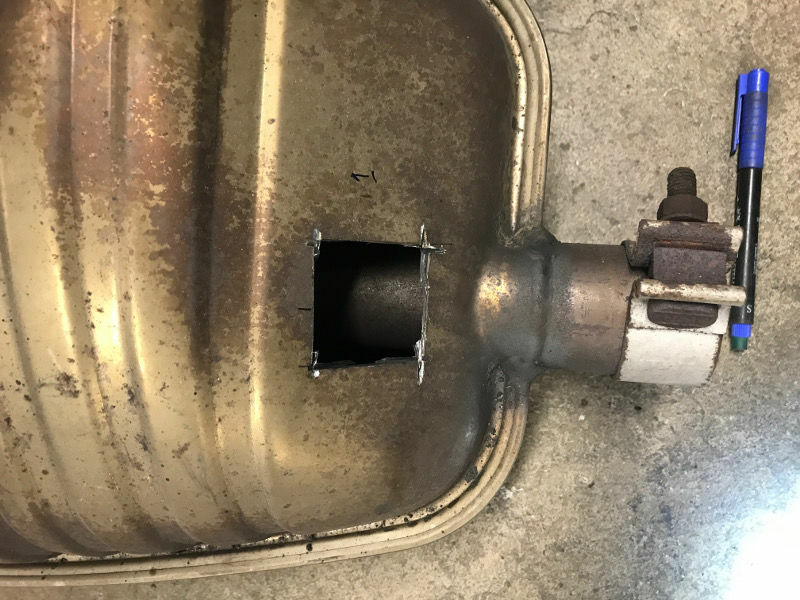 To avoid grinding down the welds to open mine back up, I took the muffler off (I'm a pro at this, now ) and used a piece of steel bar to make my holes oblong by going through the muffler inlet. I sharpened the tip of the bar to a chisel point, then used a 5lb sledge to hit the hole edge on with the chisel. Rough estimate is that it's equivalent to three or four 1" holes per side, now. Sound is great and I'm satisfied now. It was only because I wanted the muffler to look completely stock from the outside. Guys, is the internal modification ANY different in sound then adding the external pipes like others have done? I too do not like the look of added pipes welded on and prefer the stock look but I can't help but think by diverting some of the exhaust prior to entering the muffler you would get a slightly beefier sound using external pipes. 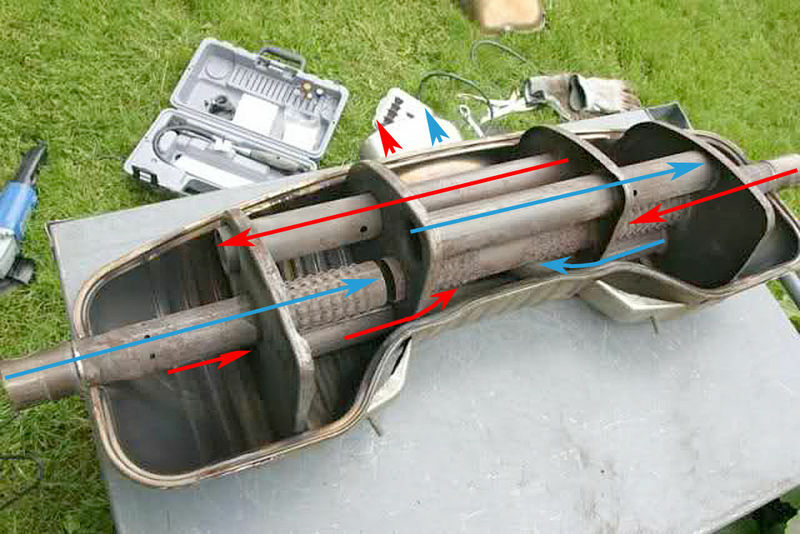 Otherwise why would places like Fister or even Pedro's Exhaust not use the easier route just to drill out the pipe. Here's a video...you must listen with good headphones or you'll miss all of the low rumble. Sorry for the wind and interstate noise. Last edited by particlewave; 07-03-2018 at 10:35 AM. Drone? The ear-splitting, make your head ring/hurt, resonance? I'd say no. It's definitely louder in the cabin, but nothing that bothers myself or my wife when cruising around town or on the highway. Last edited by particlewave; 06-25-2018 at 09:20 PM.